I haven’t had many bosses. Frankly I am not very good at working for other people – I got fired from my my first job stocking shelves at Budgens because of “bad attitude”. I got fired from my job as a reporter at Computing because I swore directly at the editor of the magazine when I was drunk at a Christmas party. I am not proud of these things. One boss that really stands out though is Sarah Aryanpur Burgess. She was a great mentor. She could be hard, but was always fair. Encouraging, solid, plenty of feedback. She would stretch us as a team, but not too far. We all felt she had our back. 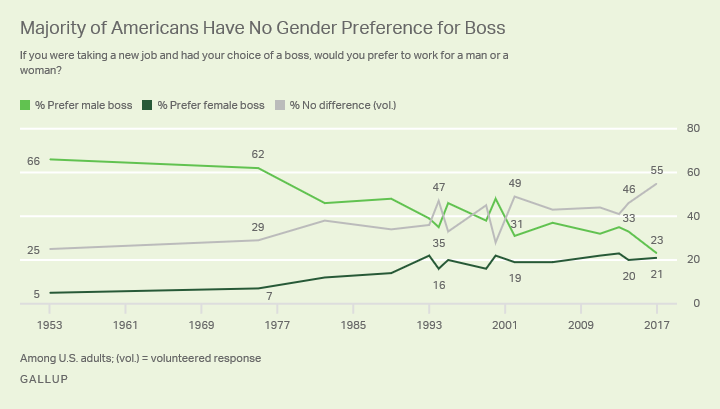 I thought of Sarah when I came across this intriguing piece of polling by Gallup – Americans No Longer Prefer Male Boss to Female Boss. This polling feels like overwhelmingly positive news to me. It’s been such a tough couple of years politically, that sometimes it feels we’re not making any progress as a culture. But hopefully we are. Maybe a lot of the awfulness is just a Reaction to all the progress we’re making. Men are being held to account for sexual harassment. That’s a huge positive in 2017. And it’s pleasing here we are at the end of the year and it’s becoming a normal idea to Americans that they might have a woman boss. Maybe it won’t be too long before we get a woman in the White House. I’d love to think that part of Hilary Clinton’s legacy might be that she helped normalise the idea of a woman running for President. I’d have preferred it if she won, but in the grand sweep of history perhaps her role is indeed about breaking through glass ceilings.